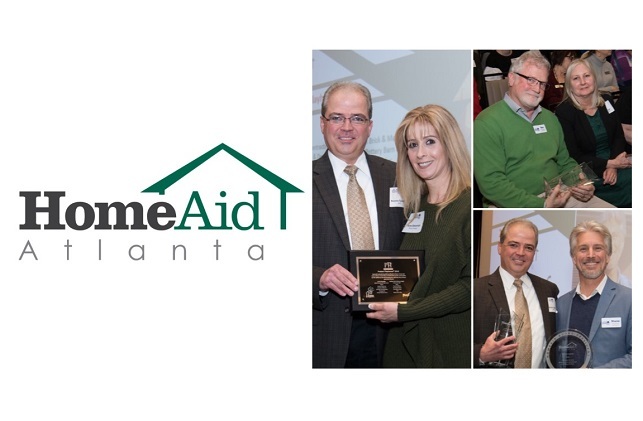 HomeAid Atlanta’s 2018 Award Winners were announced on January 17 during the GAHBA’s annual Installation and Awards Program at The Omni Hotel at The Battery Atlanta. These awards honor organizations and individuals who demonstrate a deep commitment to HomeAid’s mission, are knowledgeable and passionate about HomeAid, and gave generously of their time and resources in 2018. A longtime HomeAid supporter, Dan O’Dwyer spent countless hours as a volunteer Builder Captain leading HomeAid’s renovation at The Drake House in Roswell. Two apartment buildings received major renovations creating a long-term housing solution called The Drake Village, located on the property adjacent to The Drake House’s existing crisis housing complex. This project more than doubled The Drake House’s capacity to help women with children experiencing homelessness in north Fulton County. This was Dan O’Dwyer’s second HomeAid project at The Drake House. In 2005, he led a total renovation of the first two eight-unit apartment buildings to produce the first crisis housing ever offered by The Drake House. homelessness. BMC also gave financially through HomeAid’s Annual Giving Campaign. Additionally, BMC’s Ronnie Gullatt enthusiastically served as HomeAid’s 2018 Board President. Anne DeLorenzo serves on HomeAid’s fund development committee. In 2018, she garnered participation and sponsorship for HomeAid’s Housing the Homeless Golf Tournament and Annual Giving Campaign. She was also integral to the return of Project Playhouse®, securing donated materials to build The Saltbox of the Earth playhouse. Additionally, she and her team at Paran Homes spent six Saturday mornings mentoring Kennesaw State University Building Construction students as they built the playhouse. DeLorenzo has been a longtime supporter of HomeAid’s annual Essentials Drive to collect donations of baby supplies for Atlanta’s homeless babies and their families.